Apart from his novel The Picture of Dorian Gray (1890), Oscar Wilde is best known for his comical plays, most notably The Importance of Being Earnest (1895). These plays wittily subvert and critique high society and feature common themes and tropes such as marriage and social standing, hypocrisy, mistaken identities, overbearing old ladies and stoic servants. As the plays are quite alike, it can be a challenge to keep them apart. Plots and characters tend to blend together. An important reason Wilde wrote these plays was the simple fact that they were very successful. They suited his style and persona and they gave him fame and fortune where his earlier dramatic attempts had failed. Before the success of Lady Windermere’s Fan in 1892, Wilde had already written three plays, each of them tragedies in a historic setting. While each of the plays contain comical asides and delicious ironies, it seems that Wilde was originally more interested in becoming a more serious dramatist. It is unfortunate then that his tragedies all met such tragic ends. Oh, and the answer is B. His first play, Vera or, The Nihilists , was inspired by the turmoil in Russia at the time, and loosely based on the story of Vera Zasulich, an anarchist revolutionary who shot the oppressive governor of St. Petersburg. In the play, Vera is a young Russian revolutionary who falls in love with Alexis, one of her fellow Nihilists, who turns out to be the son of the Tsar. 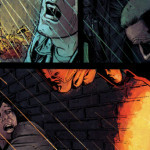 When his father is assassinated and Alexis takes his place, Vera is tasked with killing him. Her love turns out to be stronger than her political beliefs and she kills herself to save him. Despite the political subject matter, in the end it is love that drove the main character. Wilde himself maintained that “it is a play not of politics but of passion” (The Letters of Oscar Wilde, ed. Rupert Hart-Davies, 1962, p. 148). 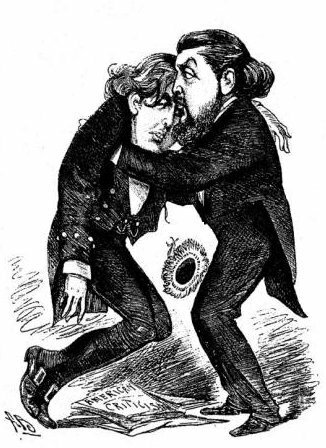 Wilde had finished the play in 1880 and by 1881 he had managed to get it into production. However, in March of that year, the actual Tsar of Russia, Alexander II, was assassinated. Due to political sensitivities, the play was subsequently cancelled while it was still in rehearsals. Vera was not performed until August of 1883 in New York, after Wilde’s successful tour of the United States. The critics were not impressed and they deemed the play too long-winded, inconsistent in language and style, and full of anachronisms. The play, which is set in Moscow in 1800, features trains and telegrams decades before they were commonplace. Not only technology was anachronistic, but also ideology as he mentions Communism (1840’s) and Nihilism (1860’s). The play was not only a critical, but also a commercial failure and the producers cancelled it after just one week. Wilde’s second attempt was not much more successful. He wrote The Duchess of Padua for the American actress Mary Anderson. It is a melodramatic love story set in sixteenth century Italy in which a young man by the name of Guido Ferranti seeks to kill the Duke of Padua to avenge his father’s death. When he meets Beatrice, the Duke’s wife, they fall in love and he abandons his plan. She, however, kills her husband in order to be with her new lover. Guido is disgusted by her act and rejects her, prompting her to falsely accuse him of killing the Duke. He is arrested and put on trial. Even though he could fight his case and expose Beatrice, he chooses to accept the fate she has set for him. The magistrates find him guilty and sentence him to be executed. Later, Beatrice regrets her actions and confesses her crime to the magistrates, but they do not believe her. Beatrice visits Guido in his cell to tell him all this and drinks a goblet of poisoned wine. After she dies, Guido takes her dagger and kills himself with it. The play was finished in 1893 but, after many discussions about opening dates, fees, and the content of the play itself, Anderson rejected The Duchess of Padua, writing, “your Duchess in my hands would not succeed, as the part does not fit me” (Oscar Wilde, Richard Ellerman, 1987, p.212). It was later picked up by the American actor Lawrence Barrett and Wilde was eager to accommodate him, offering any rewrites the actor deemed necessary. The play was finally performed in 1891 under the name Guido Ferranti, undoubtedly to satisfy the ego of Barrett, who played the lead role himself. The actor had also demanded that Wilde’s name be removed from the play, as he regarded him as box office poison after the failure of Vera. Even so, the critics were divided, one lamenting that “the radical defect of the work is insincerity. 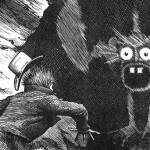 No one in it is natural.” (New York Daily Tribune, January 27, 1891) After only three weeks, Barrett pulled the plug on the production. Later, Wilde tried to have the play produced in England but he was rejected by renowned actors Henry Irving and George Alexander, who would later produce some of Wilde’s more famous plays. 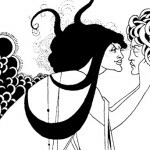 The best known of Wilde’s tragedies, Salome was originally written in French when Wilde was staying in Paris in 1891. He translated the play into English in 1894. The play is based on the biblical story of Salome, the daughter of Herodias and stepdaughter of King Herod Antipas. When she dances for him on his birthday, the king is so pleased he promises to grant her any gift. Knowing it will delight her mother, Salome asks for the head of John the Baptist on a silver platter. The prophet had earlier condemned Herodias for divorcing her first husband (somewhat confusingly called Herod II, and the older brother of Herod Antipas). The king is taken aback by her requests, but his oath compelled him to comply. The story, as relayed in Mark 6:21-29 and Matthew 14:6-11, does not actually name “the daughter of Herodias”. The name Salome originates from Antiquities of the Jews (93 or 94 AD) by the Romano-Jewish historian Flavius Josephus. Wilde crafted his own tale, using these and other sources, most importantly the short story Hérodias (1877) by Gustave Flaubert, which introduced him to the subject. In a notable deviation from the original story, in Wilde’s play Salome lusts after John the Baptist (here called Jokanaan), demanding that he let her kiss him. He rejects her, despite her incessant demands, which come to sound more and more threatening. In this light, her demand for his head is also the sadistic act of vengeance of a spurned lover. 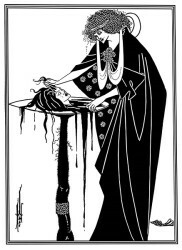 When Salome finally kisses the lips of the decapitated head, the disgusted King Herod orders her death, making her yet another one of Wilde’s love-struck heroines who meets a fatal end. In 1892, rehearsals began for a London production with the lead role being taken by famed French actress Sarah Bernhardt, who was already in her late forties. Despite typical back and forths between Wilde and Bernhardt, the rehearsals were going well. That is, until the licenser of plays for the Lord Chamberlain, the British government official in charge of theatre censorship, banned the play. This decision was based on an old law prohibiting the portrayal of Biblical figures. The sexual and depraved nature of some parts of the play will undoubtedly have played a role in the decision as well. Wilde was furious and threatened to renounce his citizenship, but few took him seriously and he never followed through on his threat. The play finally had his premiere in Paris in 1896, when Wilde was in prison for some sexual acts that were considered depraved as well. He would never see the play performed. While Wilde was working on his successful comedies, he had also started writing two new tragedies . Both of them were left unfinished at his death in 1900, and remain with us merely as fragments. Wilde laughed off the loss, calling the cab “a proper place for it”. Simone continually praises Guido, until finally he compares the young lord’s sword to his own, wondering which is better. He proposes a duel to find out. Guido, annoyed by Simone’s behaviour, eagerly agrees and they fight, with Bianca urging Guido on to kill Simone. Unexpectedly, Simone manages to disarm, overpower, and eventually kill the young lord. The husband and wife are left together, seeing each other in a different light. “Why did you not tell me you were so strong?” she asks. To which he replies, “Why did you not tell me you were beautiful?” For once, the play shows a cuckolded man, and one of lower class as well, emerging victorious. I love Wilde’s take on Salome (and her tragic demise) and Beardsley’s illustrations which I always find intriguing and unheimlich at the same time. 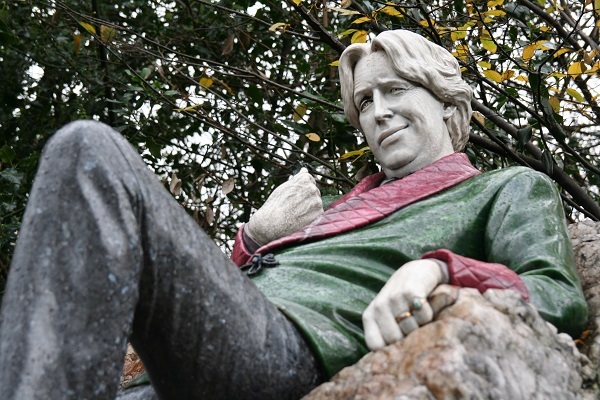 Having said that, the statue of Wilde in Dublin is by far the most confusing sculpture of the man himself.